A growing export and a strong propensity for innovation are outlining the trend of a manufacturing chain able to approach new markets and to adopt the most advanced production trends successfully: from electric motors to hybrid technologies. 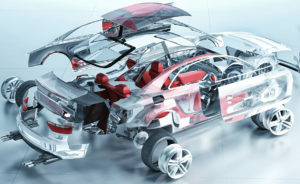 The market of Automotive components is living a thriving time in Italy. As confirmed by 2016-turnover of about 39 billion Euros and export data accounting for almost 20 billion Euros. Figures that let us be confident, not only for the current year but for the incoming ones as well, laying the bases for starting innovative projects in the automotive industry and the approach to more and more strategic foreign markets. It is interesting to notice that today 75% of a vehicle is constituted by parts and components: a percentage that underlines the fundamental role played by the manufacturing chain of enterprises making up the sector of Automotive components. A field that, in Italy, stands out for dynamism and growth performance, besides a significant penetration into new Countries. «The Italian componentry is a field that in Italy counts about 2,000 companies and 136,000 employees, with a yearly turnover of about 39 billion Euros. 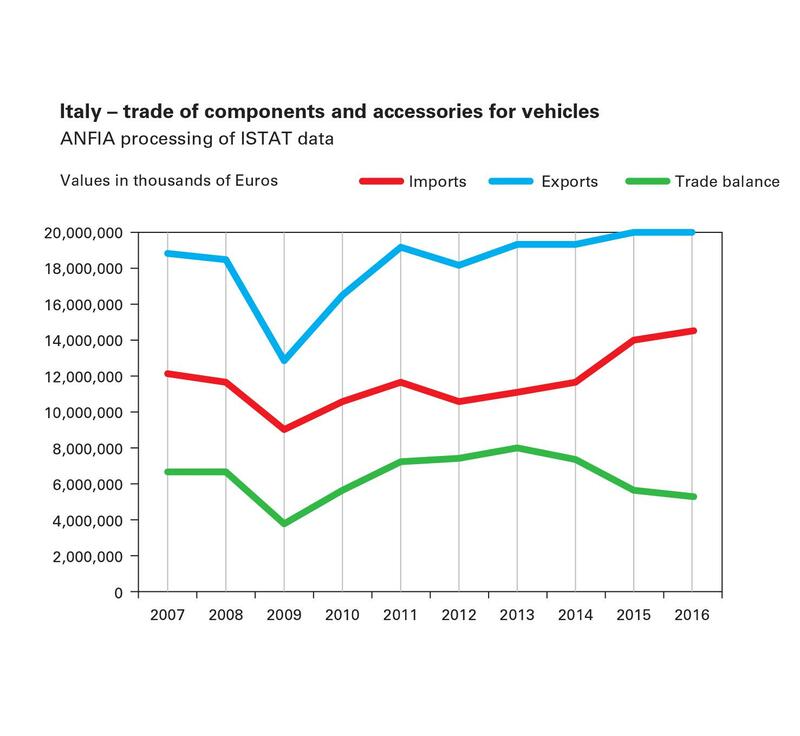 In 2016, the export value rose to 19.97 billion Euros, with a positive trade balance by 5.5 billion Euros», stated Giuseppe Barile, President of ANFIA-Components Group, during the convention “International scenarios in the automotive sector”, organized last April in Turin, to ponder possible scenarios and the future economic opportunities in the Italian and foreign Automotive industry. A positive business trend that, according to ANFIA, is likely to be confirmed also in the current year, considering the car market trends in Italy, for 2017 and 2018, are neatly positive and also the production of vehicles in our Country is expected to score a moderate growth. In the first 2017 quarter, the data presented by ANFIA confirm Italian component manufacturers’ capability of keeping their export volumes high, granting high quality and high innovation level of products and processes to the market, supported by a favourable ranking on international markets, too. Among the most interesting Countries, as highlighted during the Turin convention, new areas stand out, like North Africa and Iran, which in the last years have succeeded in offering new interesting development opportunities to the Italian enterprises operating in this sector. «The manufacturing chain of Italian components must seize these new possibilities studying suitable penetration strategies for the peculiarities of these markets» explains Giuseppe Barile. «The prospects we are facing, despite the political turmoil triggered by Brexit and by the election of the USA President Donald Trump, are not destabilizing. Europe features a globally positive situation, with moderate growth expectations, in search of a new stability. If we consider the enterprises of our production chain, it is likely that big multinationals will be called to an adaptation to local realities, and then to a higher flexibility, which means to suit better contexts, legislative and tax rules and, in general, the requirements of the single nations were their subsidiaries operate. Meanwhile we foresee significant opportunities for SME, which will rely on their proximity to the market and exploit at best the new technologies in manufacturing processes – Industry 4.0 and digitalization – in favour of the highest flexibility and customization of products». 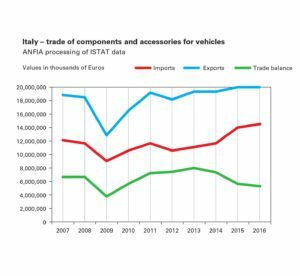 The export of automotive components represents 4.8% of the entire Italian export (a value in line with 2015-year’s), whereas imports are worth 3.9% approximately. «In 2016, the export of components remains positive, confirming the good sector trend in foreign markets» commented Giuseppe Barile, President of ANFIA-Components Group. «As already in 2015, exports, combined with the domestic demand, backed the national manufacturing. This occurred for both the vehicle field (with a production growing by 8.8% in 2016 and sales abroad rising by 6.3%) and for automotive components, with the 0.7% production upswing in the year just ended». According to ANFIA, the orders, for the component production sector, grew by 4.4% in 2016 (by 5.7% for domestic components and by 2.8% for foreign ones). The first destination market of the Italian component export remains Germany, with around 3.9 billion Euros (-1% compared to 2015) and the 19.5% percentage (19.7% in 2015) on the total exported, while, for the second consecutive year, Japan confirms to be first among Asian destination Countries (and fourth non-EU market, after Turkey, USA and Brazil), with over 395 million Euros (+31.3% versus 2015), with a positive trade balance amounting to 174 million Euros (they were 82.4 million in 2015), surpassing China (346 million Euros, with the 16% upswing compared to 2015 and a negative trade balance of 690 millions). Decreasing by 23% are instead the exports towards the NAFTA Area, by a value of 1.5 billion Euros, maintaining a positive balance of over 605 million (892 million in 2015). The export value drops by 28% towards USA and by 13% towards Canada, whereas in the last part of the year it recovers towards Mexico (+0.9%), Country that in 2016 attained a new manufacturing record, with over 3.6 million vehicles (+0.9%) and now living a diversification phase of investments and of decreasing dependence on United States, after the protectionist measures adopted by the new American Government. The subdivision of components into macro-classes witnesses the mechanical part ambit (including accessories and glasses) achieves 65.4% of the export value, with 13.06 billion Euros (-0.2% compared to 2015) and a positive trade balance of around 5 billion (5.5 in 2015). The motor field follows, with a value of 3.86 billion Euros (-0.3%), weighing by 19.3% on the total exports of components, with a positive balance of 1.13 billion Euros. The field of tires and rubber items for vehicles features an export value of 1.19 billion Euros (-1.8% versus 2015), with a negative balance of 482 million Euros. The exports of the sound reproducer field score instead the 14% increment. The export of electric components and similar achieves the 6.3% growth, with a positive balance of 71 million Euros (75 million in 2015). Concerning single components, a significant positive trade balance is reached by motors (1.13 billion Euros), brakes (945 million Euros), bridges with differential (674 millions), pumps (374 millions), glasses (325 millions), wheels (303 millions), headlights and lamps (222 millions). According to the preliminary data released by ANFIA, in February 2017, the domestic production of cars registered the 6% rise, with almost 65,000 manufactured units. 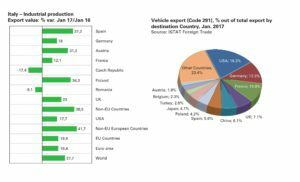 Export and domestic market went on driving production data: in the first 2017 quarter, the automotive market achieved growing volumes by 12%. In particular, in January 2017, the vehicle exports from Italy reached a value of 1.74 billion Euros (+27.7%), representing 5.5% of all exports, whereas the vehicle imports account for 2.48 billion Euros (+27.9%), i.e. 7.7% of all Italian imports. 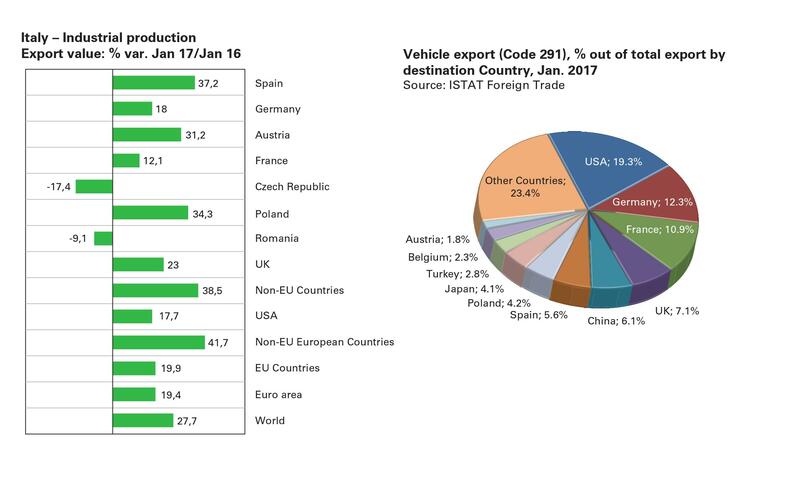 United States represent in value the first destination Country for the export of vehicles from Italy, with the 19.3% percentage, followed by Germany and France, with shares by 12.3% and 10.9% respectively. 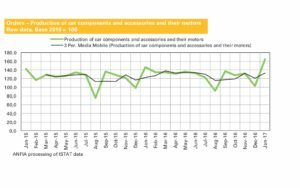 In this context, also the Italian production of components and accessories for vehicles and their motors ends the month of February with a positive trend (+9.9%) and the first two months with +4.5%. In January 2017, according to the last available data, the orders of this specific field grew by 12.6% (+13.6% domestic orders and +11.6% foreign orders). 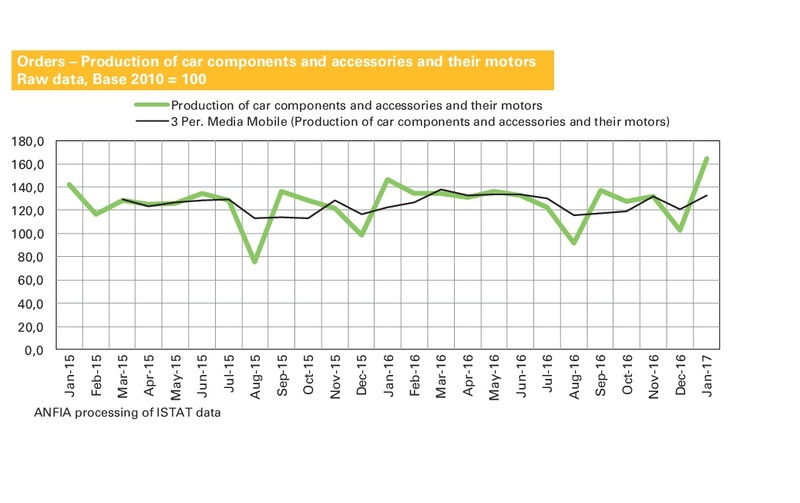 The turnover achieved by components is therefore growing by 10.2% in January, especially thanks to domestic components, with the 12.1% upswing. How will the car of the future be? What technological, structural and manufacturing demand will it satisfy? «The current technological trends move towards a double direction: an increasingly sustainable, but also safer and smarter, mobility» explained the President of ANFIA-Components Group at the Turin convention. Within 2021, the European car industry will reduce CO2 emissions by almost 42% compared to 2005, so becoming one of the most virtuous industrial sectors: «This means that the Automotive manufacturing will go on investing in the optimization of vehicle technologies, aiming at a further improvement of the internal combustion motor efficiency and at the weight reduction, through the use of new materials and nanotechnologies as well as a greater diffusion and an enhancement of the performances of vehicles with alternative power supply». This scenario influences a more and more incisive development of alternative and hybrid technologies in automotive ambit, even if Italy seems to proceed more cautiously in comparison with the other European Countries. According to an analysis by ANFIA, in the ranking of European Union nations, extended to EFTA, during 2016 Italy holds the eleventh position by registrations of electric cars (including pure electric, hybrid plug-in and hybrid extended range), with just 2,827 registrations out of a total of 206,600, even if growing by 20.7% versus the previous year. Their market share in Italy is 0.2%. Hybrid cars (encompassing petrol-electric and diesel-electric) registered in 2016 are 37,000, rising by 47.2% compared to 2015, corresponding to 12% of the European market. Their market share in Italy is 2%. If we analyse the car registrations in the first 2017 quarter and we subdivide them by power supply, in March the market share of petrol cars remains stable with 33.5%, whereas for diesel cars the percentage grows from 55.8% in February to 56.2%. The market of hybrid and electric cars features rising volumes that exceed the average, both in the month and in the progressive since the year beginning; the market share, even if inferior to February one (3%) reaches 2.6% in March, versus 1.8% of one year ago. LPG cars show an exceptional growth as well, both in March and in the first quarter, rising their market share to 6.1% in the month (6.3% in February), against 5.4% of one year ago. Natural gas cars are instead still dropping; the penetration percentage, even if rising in March 2017 (1.6%) in comparison with the previous month (1.4%), is lower than one year ago (2.5%) «The purchase price of hybrid and electric cars, considering in particular electric models, is still too high for a mass diffusion, if it is not supported by adequate incentive policies» states Giuseppe Barile. «On the other hand, the electric car industry sets the target of reaching production levels finally allowing significant scale economies and then a decrease of car purchasing prices, thus widening the range of buyers. In general, future prospects indicate a mix of alternative power supplies, according to a technology-neutral approach, in conformity with the limits of emissions and environmental targets established at European level». Moreover: «It is worth reminding that the development of infrastructures for alternative fuels is a key element for the enhancement of the relative market of vehicles with alternative power supply and is progressing, in our Country, thanks to the implementation of the European Directive DAFI. This outlines for the first time a shared framework of measures aimed at the implementation of infrastructures for alternative fuels – including the minimal requisites for the construction of recharge points for electric vehicles and natural gas refuelling points (LNG and CNG), LPG, biomethane and hydrogen – to be carried out through national strategic frameworks. The Legislative Decree 16th December 2016, n. 257, in force since 14/1/2017, governs the implementation of the Directive in Italy and is fruit of a synergistic work among ANFIA and the other concerned associations». Previous Post Automated assembling of electric motors with hairpin technology Next Post May 2017: new issue of the online free magazine Metalworking World Magazine. Enjoy your reading!